Let us – in Fleetwood – not forget our past. Our fishing heritage which has shaped the lives and destiny of so many. The last hundred years has seen the “boom and bust” of the fishing industry in Fleetwood. Lives and livelihoods have been built around the search for fish (which still goes on today). But ships and men have been lost, often without trace, leaving families and communities to grieve – and wonder what happened to their menfolk. 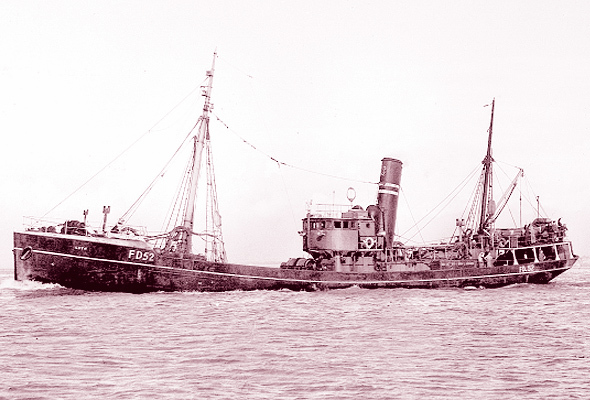 One such trawler failed to return at Christmas 1948. Families of 21 men waited in vain for news. A town mourned! Her name – the Goth – has gone into the history books. We featured the Goth’s story in our ‘Trawler Tales’ four years ago but the story has not ended. A miracle happened when the funnel of this 395 – ton vessel was trawled up in the net of an Icelandic trawler nearly two years ago. The Goth – undetected on the sea bed off North West Iceland – had been found. Her last resting place – a grave for the brave crew – is now known. Some small comfort for the relatives. And the funnel had been brought – back to Fleetwood – to become a lasting memorial. A group of relatives have set up a fund – Fleetwood Fishermen’s Memorial Fund – to build a permanent reminder of the sacrifice of the port’s fishermen. The 17ft funnel encased in Perspex will be incorporated into the structure. Already over £2,000 has been raised and discussions are being held to find a suitable site. A member of the relatives group said the discovery of Goth’s final resting place had been very upsetting at first. But it was comforting to know where the grave was. “It had been a mystery for 50 years. When we first saw the funnel there were tears and hugs. It was a very poignant moment. “Now we just want to get the memorial situated,” he said and added the relatives group was grateful to everyone who had offered help and support. Goth’s disappearance – as families prepared for Christmas – was a tragedy which devastated the town. For over two weeks there had been neither sight nor sound of the vessel, owned by Wyre Steam Trawling Company. She had left port on December 4th with a crew of 21. She carried a radio and had enough provisions for 30 days. Goth was due home for Christmas and she was last heard of on December 16th. A wireless message, picked up by the Hull trawler Lincoln City, revealed Goth was going into Adalvik ( NW Iceland) for shelter. After that – silence! A full scale air-sea search was launched – but nothing was found – and it was abandoned in January 1949. With her fate unknown, the tragedy was felt deeply throughout the port. For many, Christmas 1948 passed without notice and presents for the Goth’s crew remained unopened. An inquiry later gave the probable cause of her disappearance as heavy weather – with the area around Iceland, being lashed by gales of 100mph. Mountainous seas were believed to have swamped the Goth. So let us remember the Goth and all trawlers which found a watery grave and all our fishermen who have gone down with their ship or been lost at sea. The Goth’s funnel has returned home – let it form a fitting memorial and be a reminder to future generations of the price paid by the port’s fishing community – by men just doing their job!